Several major hurdles undermining hemp cultivators’ ability to run successful, profitable businesses are set to crumble once President Donald Trump signs the 2018 Farm Bill. Challenges such as finding processors or accessing banking services – problems attributable to the patchwork of state laws and regulations that have so far underpinned the industry – will be directly addressed by the 2018 Farm Bill. In addition, issues such as finding adequate harvesting equipment or qualified management could be resolved over time as a result of hemp and CBD’s new federally legal status. Expanding access for the hemp side of the cannabis industry could also have a positive effect on the marijuana industry, as well, in that it will provide a pathway for growers to experiment with a variety of the plant that is federally legal – which could lead to improved processes for all cultivators. Data regarding hemp cultivators’ top challenges was published earlier this year in the Hemp & CBD Industry Factbook, before any significant movement on the federal level. The report showed that the top challenge – by a wide margin – was finding processors, largely a function of the inability to look outside their home states. But once the 2018 Farm Bill is signed, growers will be free to ship their products to processors across the nation. “While the new provisions allow states to adopt their own plans for regulating hemp, no state can prohibit the transport of hemp across its lines,” said Shawn Hauser, chair of the hemp and cannabinoid group at Denver’s Vicente Sederberg law firm. That provision allows growers in a state such as North Dakota – where just five hemp processors were licensed in 2018 – to ship their crop to Oregon, which has more than 150 licensed processors. 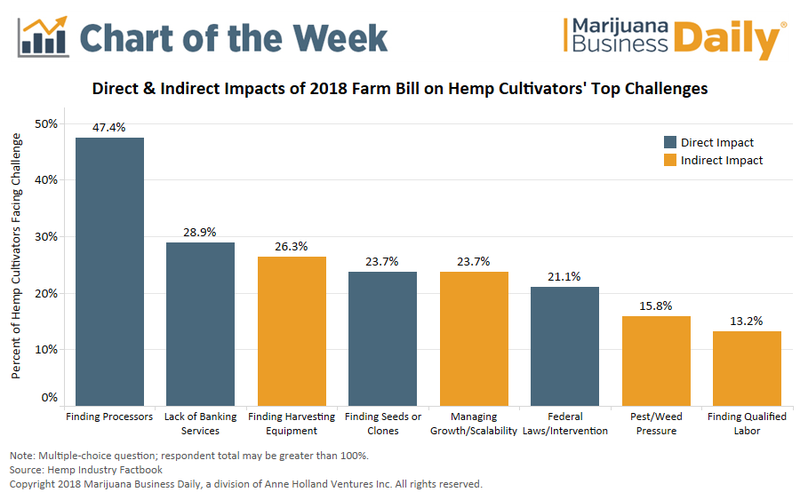 The 2018 Farm Bill will also directly alleviate hemp cultivators’ lack of banking services, opening the door to increased access to investment capital and low-interest loans – financial vehicles businesses in the mainstream economy can readily employ. It is worth noting, however, that while concerns around federal laws and intervention are directly addressed in the Farm Bill, uncertainty around the legality of CBD remains. The Farm Bill removes hemp and its derivatives from the Controlled Substances Act, though CBD will still be regulated by the Food and Drug Administration (FDA). That means CBD will still be subject to the provisions of the Federal Food, Drug and Cosmetic Act (FFDCA), which may ultimately limit the ways the extract can be marketed and sold commercially. “It’s significant to acknowledge that the 2018 Farm Bill expressly doesn’t do anything to amend the FFDCA that still governs all food and drugs, cosmetics and devices sold in commerce,” Hauser said. While these direct impacts will likely play a significant role in moving the hemp industry forward, multiple other challenges will be indirectly impacted as well. Access to equipment, managing growth and scalability as well as to qualified labor may improve through the introduction of new public and private investment. Financial losses to pest and weed pressure can also be reduced by allowing hemp cultivators access to traditional crop insurance products.